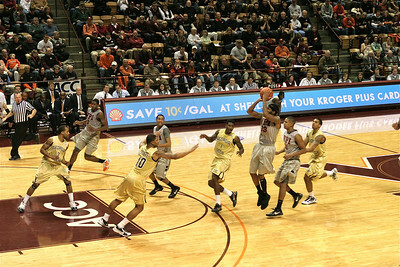 The Hokies met Georgia Tech on 13 February 2011 for a throwback game to 1979 and the Metro Conference Championship season. Coach Charlie Moir is here for honors as the winningest basketball coach in Virginia Tech history. The Arc of Delaney! 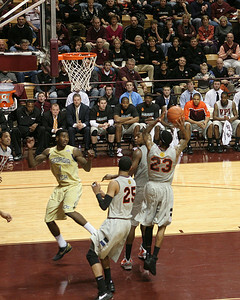 Malcolm Delaney is an 88% free throw shooter here shooting one of about six technical fouls against Georgia Tech, hence the open lane. My high school basketball buddies and I called this loopage. I captured several shots all the way to the basket and combined them to show the full arc of the basketball from Delaney to the net. The team lines up for the National Anthem. Note that five players are not dressed out - all out for the season due to injuries. That's 1/3 of the team and a significant chunk of the scholarship players. Not to mention most of the biggest players. 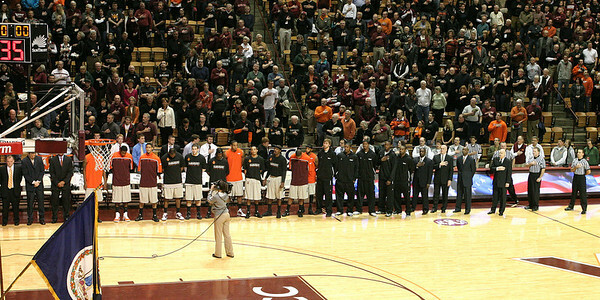 The Hi Techs and the Hokie cheerleaders perform during a time-out. 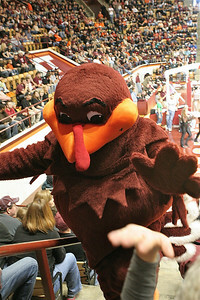 High five from Hokie Bird! 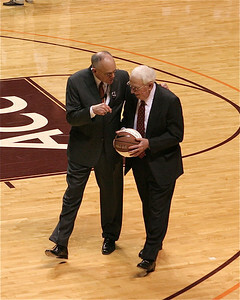 Coach Charlie Moir (with the basketball) returns to the Cassell for honors. 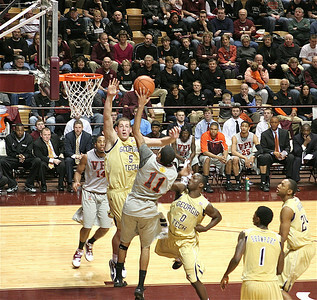 This is the Two-Three Zone adopted by Seth Greenberg as a strategy to avoid too many personal fouls to the few primary players left after injuries, and to defend and upset the rhythm of the opposing offense. It's been working spectacularly. I should note that it is similar to a zone defense run by Syracuse and Greenberg has an assistant who used to play there. 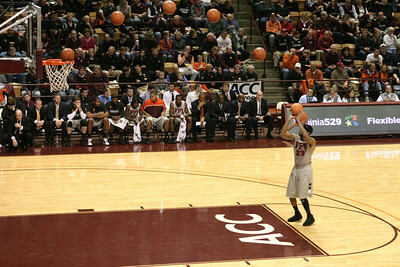 Malcolm Delaney pulls up to shoot a 3 pointer. Delaney had a record day against Georgia Tech. 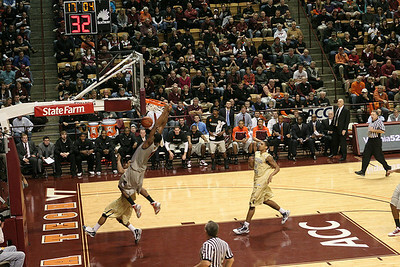 Terrell Bell who is having a great off-the-bench season goes for the dunk and gets fouled hard to the floor. 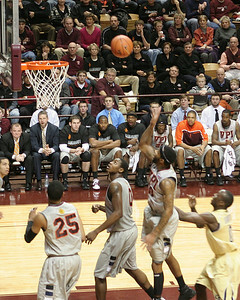 Malcolm Delaney pulls up with a short hook shot. Malcolm Delaney pulls up with a short hook shot and finishes. 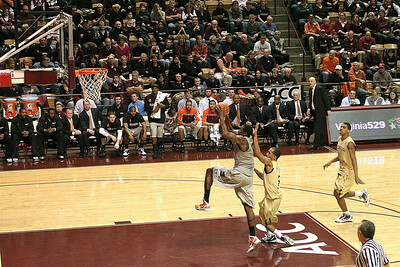 Erick Green shoots a left handed shot against the six-foot-eleven center of Georgia Tech. 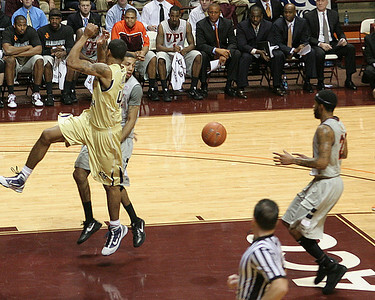 Erick Green passes behind his back for an assist to Malcolm Delaney. 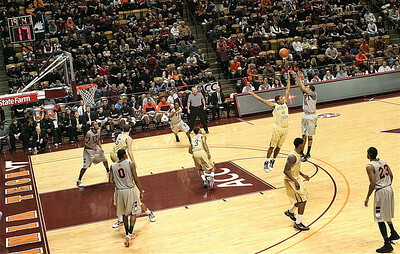 Erick Green takes a shot from the top of the key. 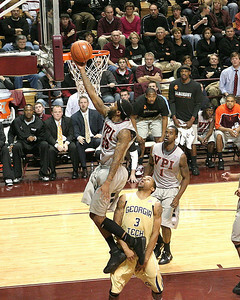 Malcolm Delaney uses his body to protect and avoid a charge on a layup to the basket. 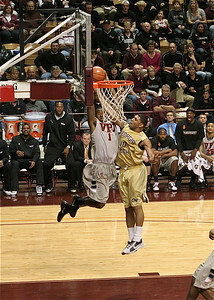 Jeff Allen takes an outlet and without dribbling goes in for the dunk. Shot 1 of 5. 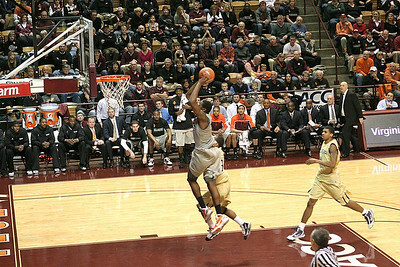 Jeff Allen takes an outlet and without dribbling goes in for the dunk. Shot 2 of 5. 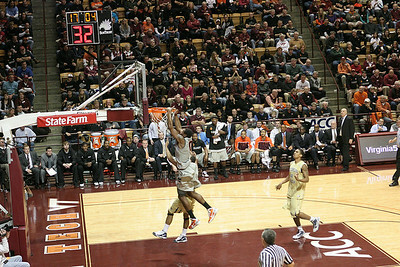 Jeff Allen takes an outlet and without dribbling goes in for the dunk. Shot 3 of 5. 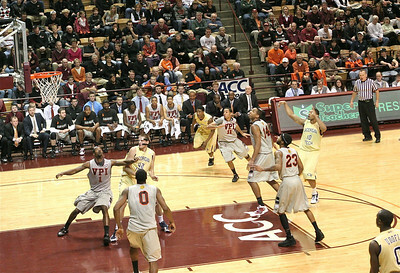 Jeff Allen takes an outlet and without dribbling goes in for the dunk. Shot 4 of 5. 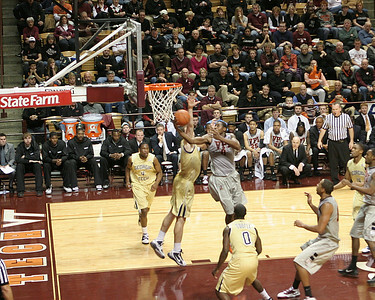 Jeff Allen takes an outlet and without dribbling goes in for the dunk as players on the bench celebrate. Shot 5 of 5. Jeff Allen makes a quick underhanded layup for two points against the Georgia Tech center. 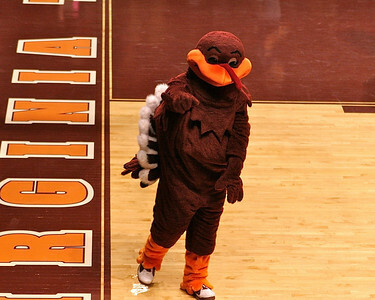 Hokie Bird points to the photographer on a job well done!